The popular image of Texas is a land of oil, beef cattle, and ten-gallon hats. Not exactly what comes to mind when you think “Amish”. And truth be told, few Amish have ever settled in the Lone Star state. But in a remote corner of the state Stetson hats give way to broad-rimmed plain ones. Bee County in south Texas has been home to a small Amish settlement since 1999. 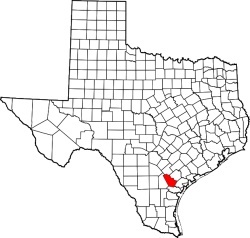 Bee County is located deep in southern Texas. The Bee County Amish settlement, located near the county seat of Beeville, was started by Amish from Tennessee in 1999. The Beeville settlement is one of the most southerly Amish communities in the country, second only to the community at Pinecraft in Sarasota, Florida. Borntrager also noted the crowded conditions of their Tennessee community as another motivation to move south (“Amish Family Breaks Ground in Bee County”, Darren Barbee, Corpus Christi Caller Times, August 11, 1999). Over the years the community has not attracted many settlers–at least not enough to form a second church district. Amish in the Bee County community have a variety of occupations. Some make buggies, others do horseshoeing (read more about Amish furniture in Texas). There is a general store and sales of baked goods. Some produce is grown using irrigation. In the community there is also some horse training, and fittingly, beekeeping. The Bee County Amish settlement attracted national attention–at least in the birding community–when a rare northern wheatear took up residence on Amishman John Borntrager’s farm. Birders flocked from around the country to Texas to catch a glimpse of the unusual arctic specimen, named “Wanderer” by Borntrager (“Arctic bird makes rare appearance”, David Sikes, Corpus Christi Caller Times, January 5, 2010). Texas saw a number of Amish attempts to settle in the early 1900s. Amish showed interest in establishing themselves in the state already in the late 1800s, with a few groups investigating the possibility of doing so. But the first bona fide settlement did not arise until 1909, near the town of Plainview in Hale County. Amish historian David Luthy informs us that this area was already home to an Old Mennonite congregation. Five Amish families, from Daviess County, Indiana and Ford County, Kansas, settled the region. However, drought and the lack of ministry led to this settlement’s disbandment just five years after its founding (The Amish in America: Settlements That Failed 1840-1960, pp 456-8). The early 1900s must have been Texas’ time, because 3 separate attempts were made to settle the state, happening more or less simultaneously. In addition to the Hale County community, 1910 saw the founding of Amish settlements in both Dimmit County and Hidalgo County deep in the southern tip of the state. Both of these settlements extinguished at about the same time as the Hale County settlement did, but for different reasons. The group which settled in Dimmit County relied on irrigation to water the otherwise arid lands where cactus and mesquite plants grew naturally. The Amish here settled along a half-mile section of road in a “village” arrangement. The reason given is that being primarily produce farmers, they farmed smaller plots of land and did not need to spread out. A new railroad was to be the lifeline to markets for their produce, but as it happened, the price of shipping from their remote location to markets in the Midwest was greater than the money their crops would bring. It quickly became evident that produce was going to be a losing proposition. Amish began moving away and though at least one farmer attempted to raise grain the following year, with some success, all were gone by 1914. Lack of a market for their crops led to this small community’s demise (Settlements That Failed, pp. 458-462). The Hidalgo settlement, on the Mexican border, existed from 1910-1914. The first settler was an Ohio native who had begun developing turberculosis and was in search of a warmer climate. Only a handful of families settled here, and no member of the ministry put down roots in the community, one reason for its extinction. Additionally, during this same time period a revolution was occurring in next-door Mexico, with the Amish within earshot of the shooting. This also contributed to the settlement’s failure (Settlements That Failed, pp. 462-3). 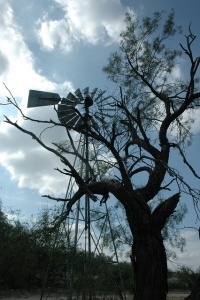 A fourth Texas Amish settlement existed for a short time in the 1920s in Cameron County, the southernmost county in the state. Luthy described this short-lived attempt to settle extreme south Texas as “adventure”; read more about the group’s attempts here. As for more recent times, by the late 1980s Amish had begun living in the area of Stephenville in Erath County. The unusual Stephenville community consisted primarily of “migrant” Amish that worked on local dairy farms. An article from the time notes a community roughly 20 families in size, where many of the Amish have phones and “live in small houses or mobile homes with electricity”, typically provided by their English employers(“Stephenville Journal; Faraway Amish Try to Keep Faith”, Peter Applebome, New York Times, August 25, 1987). The Bee County settlement has existed for over 10 years, and remains the lone footprint of Amish in America’s second-largest state. While Amish frequently migrate, founding new Western communities in recent years, it remains to be seen if much future settlement will occur in Texas. No one has been able to answer yet on whether the Stephenville community still exists. From doing a search online for Stephenville Amish, I have found people from time-to-time that suggest it still exists, but so far have not received any concrete proof one way or the other. In addition to the Beeville community and possibly the Stephenville community, Texas is also home to several Beachy Amish groups and a few mennonites. There is a conservative (non-buggy) Beachy group in Bastrop, Tx. that is a church plant from a slightly less conservative group in Lott, Tx. There are similar groups Grandview, Tx and Grays Prairie, Tx. There were more than seven Mennonite families living near Lott (about 30 miles from Temple or Killeen). They owned the local auto parts store and a dairy. One family owns Lone Star Structures and builds storage buildings and playhouses. Another owns Golden Rule Gazebo and their family builds gazebos. There is also a family that sells furniture. There was a family who opened a bakery and sandwich shop and another that was building custom houses but they moved away. I believe there may be other families but I’m not sure what they do and only met them in passing. As far as I know these families are all still in the area. They have a church and school, do drive vehicles and have electricity but they do not have televisions, their vehicles do not have radios, and they use computers in their businesses. They do not use musical instruments and sing only a capella. The men usually wear store bought button down shirts and slacks and the women wear handmade dresses in pastel colors and pastel bonnets but not of the type that many will think – of a lighter weight material and more like scarves a horsewoman might wear than an actual bonnet. Lott is so fortunate to have Mennonite families living in and around our community. They still own Falls Farm and Auto Supply and have been in that business since 1983 (if they don’t have it, they can order it); Miller’s Country Market,a very popular eating place known throughout Central Texas and even further and the cleanest place you’ll ever eat in – my fav deli sandwich, their Special Chicken Salad on fresh baked 9 grain bread; builders Lone Star Structures, Deer Creek Structures and Sunview Builders, check them out online for storage buildings, garages, cabins, dog kennels, horse stalls, gazebos, outdoor furniture, etc., and they ship just about anywhere, even out-of-state. And talk about wonderful neighbors! The Mervin Lantz family lived across the street from my parents and next door to me for many years. Amazing, kind, thoughtful, servants of God – love them still and always will. There were Amish there in the 80s through part of the 90s. They were around Stepenville, Dublin and Lingleville. I believer there aren’t any around there any more. There were some around Cisco a d Chilton near Waco. The Mennonites you’re thinking of live south of Chilton along Hwy77 and Hwy 320 north, south, and west of Lott. They also live IN LOTT. Jessica, David Luthy does not list it in his latest 2008 Amish settlement guide, nor is it in Raber’s 2011 Almanac. I also believe Stephenville is included in his addendum booklet to the Settlements That Failed book but unfortunately was not able to access that to confirm in time for this post. But I believe I read it in there a while back and will check to confirm. In any case was not really a very orthodox community from what I understand with Amish apparently living not in their own properties. Possibly a few Amish go down for this work still but I don’t think what could be called a settlement exists there. There is no longer an Amish presence in the Stephenville area. There is a small community of Old Colony Mennonite, Amish and a few other Anabaptist (as well as a family of Conservative Friends (Quakers)) near Halfway, which is near Amarillo. My wife and I moved to Minnesota 2 years ago from the Stephenville area. I’m curious as to what qualifies a group as a settlement. I live in Texas and have visited some groups in the area that are as Jessica mentioned, mainly Beachy or Mennonites. The communities I’ve heard of from them are Bastrop, Beeville, Commerce, Lott, Plainview, Grandview and maybe Stratton. Stephenville does have a monthly Bazaar and last I heard about 20 families. I think that the bishop has a sense of humor. I went to college in Corpus Christi which isn’t that far away from Beeville and the humidity is there 364 days of the year. I used to know some Amish from Stephenville but I can’t recall names nor know what happened to them. It’s up to interpretation, but David Luthy defines a settlement as 3 families, or 2 if one of them is a member of the ministry. I think that is a pretty fair definition. Two’s company, three’s a crowd. And it can be 2 instead of 3 with a minister, b/c attracting ministry to settle is a vital part of getting a community to take root (no minister means it’s a lot harder to hold church, though ministry from larger settlements will often visit fledgling settlements to tend to spiritual needs like church and baptism). Thanks to a friend at the Young Center I was able to double-check on Stephenville. According to Luthy (whose work is top-notch) the Stephenville settlement (or Stephenville/Dublin as he describes it) existed from 1982 to 1993. It’s possible that there is a bazaar of some sorts (and if they’ve maintained connections, maybe individual Amish, or youth, still go down to work there from time to time?) but I don’t think there is any strong evidence of a bona fide settlement here that would go against Luthy’s info. I’ve also seen mention of Amish at Stephenville here and there, and even the 20 families number in places, but I believe that info may be adopted from the NYT article I mention above, which also mentions 20 families, but was written in 1987. So I’m going to go with Luthy and the other sources on this one who don’t include any info for Stephenville. A E Beckham, that is funny…I’ve only been to Texas a few times, but of course have the impression of it as a hot state. I understand it can get chilly though. Tennessee I’ve spent a lot more time in, and it’s definitely humid. But I wonder if Bishop Truman wasn’t pulling some legs. By what you say sounds like the Beeville area is more humid than he makes it seem! All Of you have made a few correct observations, But Have a lot of things wrong. and will never get a lot of info talking to someone that is practicing the Amish way of life. as they have a lot of secrets that they will never tell to someone that is not Amish. The only way to get that info is to find someone (like me ) that has been Amish But is no more and will visit . I’ve been to Beeville several times, but never knew of an Amish settlement. I’ll have to take a better look next time. Obviously the Texas life style doesn’t lend itself to Amish or for that matter Mennonites of Quakers (which I am). I don’t own a pickup truck or a gun, so I have never fit in. My job took me here, but fortunately I still have our place in Lancaster, PA where I feel more at home. have accomidations, ie hitching post, shading and potable water for thier horses. We welcome the Amish community every 1st Saturday of the month for our trade days where we greet, meet and patronize thier booths. I have visited the area with my 14 year old daughter allowing her to see a different lifestyle. She asked many questions that I was unable to answer. I wish there was a venue where we can get to know them and thier ways better. I am now back and living in Beeville and am proud to wave at my Amish nieghbors as we meet at an intersection. If I could give them a message, it would be that we are as curious of them as they are of us. lets open a dialog. Jose thanks for sharing this. You ought to strike up a talk at the next Trade Days, or go out to one of their shops. They no longer have trade days in Beeville due to a lack of participation. So, I suppose the only way to purchase their goods, is to visit their farm. Does anyone know if they have any Belgian horses and if they have a Belgian stallion ? I have a mare I want to have bred. Thanks. (Amish, Mennonite, Brethren, etc.) in Texas. There are two Beachy communities that I know of, one near Bastrop and the other near Temple. There is an Old Colony Mennonite Settlement near Seminole. There are numerous unaffiliated Mennonite congregations, as well as Conservative Mennonite Conference and Mennonite Church USA churches. The fastest growing Mennonite congregations are Hispanic, with many being ‘banned’ by their Mexican Catholic families. I have been to Moran a couple of times. Just drove thru. I have never seen any Amish there. It seems like most Farmer’s Markets in this area (South Texas) have produce that actually comes from the valley. I was wondering if they ever had produce that was locally grown or dairy from grass fed animals to sell? There are Mennonites churches that I have attended in Grandview, Oseola, and Cleburne TX. Though Cleburne was pretty liberal as far as technology goes, the dress was still pretty traditional mennonite. Oseola was middle of the road. Grandview was pretty conservative, but not old order. The members drove cars. Amish in Beeville-where do they hide...? I also went to Gonzales,and met people who lived in Boling Texas,and there was an Amish community in Sulpher Springs ,too,at one point. I have seen an Amish booth set up selling pies etc. at Maeket Day (second Saturday, each month) in Beeville. The woman I saw had a flowered print in her dress so I am wondering if the are Beachy. Any information would be welcomed. Avid reader of Christian books based on the Amish and I live close by so I am interested. Pauline, Beeville is the only Amish community in Texas. It’s not really a big tourist place though so you’ll probably be disappointed if you have high expectations in that department (it’s a small community, definitely not Lancaster County). I attended and consigned antiques to the Borntrager Annual Auction held Nov 2013 at their farm. The auction was well attended and lasted all day. Animals, furniture, quilts, buggies, farm equipment and much more was sold. Two auction rings were going at the same time, and a separate building was set up for the selling of food and drinks. It was a really fun day, and I am looking forward to the next auction. They have been holding one annual sale in the fall, but I was told that possibly a second would start being held in the spring. They do have a General Store where you can purchase produce, honey, eggs and misc. items, which is open every day except Sundays. Very friendly community. Exactly where are the shops located in Beeville and what type of shops are there…? For those of you who are interested in the Amish Community outside of Beeville, TX. I have some information which might be helpful. Last November, I attended an auction that is conducted yearly at one of their sites. It is their (or someone’s) place for providing “Riding and/or Roping Lessons”. Anyway, I asked a couple of the girls that were seving their food at this auction, if they have like a merchantile somewhere and how I might find it. They told me it was up the road from where we all were. It is about 8 miles out of town, on a Farm to Market road, which makes sense. From what I understand, they do have a small store there, where they sell their “goods”. Take Hwy. 59 out of Beeville, heading West (toward George West) and turn left on CR 796, follow it around to Kinkler Ln. You will be heading toward Tynan. And you shold be able to find it using those directions. I haven’t been there yet, but I plan on going very soon. Thanks a bunch and best of luck to y’all. I lived in the area for almost 40 years. I have never been to the Amish store, but I have known people whom have. Your directions seem to be the same directions that I have been given through the years. I have seen the Amish as far south as Mathis, tx saleing their goods. I am going to Beeville in the next few days. I hope to talk to Bishop Borntrager and I have a list of questions. I have noted a few things from here also to ask. Naturally I plan to get pictures of buildings, buggies, the Borntrager Combination Shop (inside and outside), etc. and will share with our group. Does anyone have specific questions? I looking for Amish Tainer for my horse, We want to have him trained to drive. I have been told the Amish are BEST at this. to have them trained to pull a wagon. They came back to us able to pull a wagon but the shape that they were in was very shocking. Sorry but I would not recommend taking any animal to this Amish community for anything. The animals smelled so bad when we got them home that they immediately got a bath and then we had to fatten them back up from starvation, a part of their training methods, there were open sores on top part of their neck under the mane. We doctored them to heal these sores. Yes they could pull a wagon but at what expense to their health. Now the mules are very healthy and able to do what ever is asked of them, but with proper training, not torture. Hi, I was sending you an in depth reply, but I guess I hit the wrong button and it all got deleted. Bascially, I have found the Amish community outside of Beeville, leaves a lot to be desired. It’s a sad state of affairs what your mules went through and I feel sorry for you and your animals. By the way, I don’t like judging or talking about people, but I think if someone is acting injust in their animal training or their customer service (what ever it may be), then people should be aware of it. Furthermore, if you would like to talk to me one on one, I can provide you with a phone number, just reply to this e-mail. Have a great day. This is not only sad, but very appaling. Perhaps, they need to be reported to SPCA, or the County Animal Control department. I mean, if this is what they did with your animals that you “paid” to have them “trained”. One can only imagine, how their animals must be subjected to. And here, they act so all high and mighty. On another note, just watch that show. “Breaking Amish”. I am truly loosing the idea, that these are “wholesome people who are so close to God”. Heavens, these people are doing things that I would NEVER dream of”. I understand they are (KIDS = under the age of 30) but damn, they are VERY judgemental. I just don’t understand how they really consider themselves as “so Holy”. Okay, I will stop ranting, but I do hope I will get at least one reply. I had thought of reporting these people at the time but was just grateful to have the mules back. The family that was training the mules at the time have moved back to where ever they came from, so no one has to be subjected to this kind of treatment of their animals anymore at least in this area. Thank You for responding to my comment. The Amish auction that is in November every year is alot of fun to go to and me and my husband will be attending. I like to bid on the housewares and visit with other people there. Maybe you can go , I think it is November 7th or 8th this year. Hope to see you there. I happened to go visit this place about a month ago. I hate to sound negative, but I was quite disappointed in what I found. The general store/merchantile, was very dusty and they only had a few baked goods for sale. The cheese, was kept in an ice chest that was sitting in melting ice/water. Not to mention, I was always under the impression that the Amish were very clean people. Much to my dismay, they had all sorts of odd and old delapidated buildings, empty cargo trailers strewn about the property. Much like a junk yard. I REALLY do not wish to sit in judgement of anyone, because I too can let my house go from time to time needing cleaning, but I was a bit disappointed. I was hoping to find a pristine general store, with quaint people who and found just the opposite, the one male (mid-teen) barely spoke a word and I found myself feeling “un-welcome” as though I had interrupted what ever it was he was doing, and when I asked for assistance with some of their “remidies” for what ails the body, the boy had no knowledge of anything they were selling, and he just frankly didn’t care if I bought something or not and spoke not one word, just shrugged his shoulders and turned and walked away. So, I hope your visit goes well, but don’t expect a whole lot. Again, I do not wish to sit in judgement of anyone, but I was very underwhelmed. And no, Beeville wasn’t having any success with their Market Days, so they cancelled them over a year ago. Thanks Valerie. I have heard similiar stories. Rather sad to hear. The Bishop seemed pleasant, and when I mentioned that I wanted to visit with him, he said Fridays were busy so a weekday would be better. I’ll try to go with a positive attitude. The pictures Debbie posted earlier looked nothing like the Amish houses and shopps in Lancaster, PA. If cleanliness is next to Godliness, the Beeville group appaently hasn’t got to that chapter yet. I didn't mean to discourage you. Thank you for the reply Bob. I really didn’t want to discourage you, I just wanted to give you a “heads up”. I truly wanted to see a prisine community, instead of the the people I usually see in “this neck of South Texas” which can be anything from beach bums, to plain ‘ol drunks and of course there’s no loss of the drug addicts. Forgive me, I digress quite often. Anyhow, if you make there and meet them, I hope you enjoy it. Please let me know how you’re experience goes. And just because I unfortunatly can be a bit of a “social critic”, I sincerely hope it doesn’t ruin your experience. I had to laugh at your comment about Breaking Amish. Don’t be fooled, those ‘Amish’ kids are not Amish. They may have been born to Amish parents, but they will only become Amish themselves when they get baptised and join the church. Till then they are paid Hollywood actors playing a part in a scripted role and by the sounds of it, it is doubtful that one could even call them Christian let alone Amish. For Debbie and others, if one has a problem with Amish, take it to their bishop. He is there to sort out all complaints and problems. I have to agree with you. They are so “Hollywood”, I thought who are these people trying to kid? I mean, I know there is a period of time, where they allow the kids to “venture out on their own” and decide, if they wish to leave their upbringing and cultural beliefes, but that crap they show on TLC (The Learning Channel) is pure crap. I mean, c’mon, why New York City. Why not the middle of Iowa, like all Amish kids want to experience life outside of their lifestyle means the “big city of New York”. They should be appalled. The girls are acting like sluts, I mean I’ve never had a brazilan wax, or stood on a street and slung my purse at a friend and acted like some whore. BUT….This is the same channel that promotes crap like Honey Boo Boo. That is the only show that can make Larry the Cable Guy, look like a College Scholar. Oh and let’s not forget Swamp People “choot him, choot him”. Or other junk TV like Duck callers? I mean. We should really be ashamed of what we as Americans watch and “tune into and talk about” on a daily basis. I have to just roll my eyes. What is this country comeing to? Is it any wonder, that other nations are so far superior in their education system and passing up us Americans on the Educational scale? Just wanted to mention the existence of another article about the Stephenville community in the Winter 1985 issue of granbury! magazine, “The Amish: Keeping the Faith in Erath County” by Candace Ord Manroe. It mentions the Amish-owned Three-Way Country Store on Hwy 67 between Glen Rose and Stephenville, and includes interviews with its owners, Allen and Katie Yoder. It also includes comments from carpenter Melvin Ray Miller, who hosted the community’s worship. There are still references on the web to Amish carpentry work in Stephenville, which I assume is probably Miller’s work. We speak to and pass regular a few horse and buggy drivers around Gonzales. They said they were from Lancaster apparently been here quite awhile. I have given the older gentleman a ride a few times when I was contacted to do so. They are great God fearing humble people I like them very much wasn’t fortunate enough to know the way of life growing up. I haven’t got full exsplanation if the religious beliefs they have yet. But he’s free in exposing it to me I think it’s very good as far as I know. Royal laws still stand with these people as should with all people. Hello. I’m wondering if you know if these people are Amish or Mennonite and where they live in the Gonzales area? Do they have a community…shops….church….??? Thanks for any additional info you can offer. I know they have farm off highway 90 going into Gonzales texas. They don’t use tractors or farm Equiptment like everyone else. That in itself is amazing to me really but they are Amish. I know somewhere they sell furniture etc. crafts around Gonzales I’ve seen them and heard from others who trade with the folks. They’re pretty talented people was the comments I heard as far as the carpentry work being very old world ornate stuff. They’re sure making some 1700-1800 type ornate furniture for one store by hand milling. That takes tons of time and work what I saw was amazing stuff. Thanks. That’s very interesting. We have family in that area. I’ll have to see if I can find them or the shops that sell their crafts. Thanks for the information. Today I was driving down Medical Drive in San Antonio and saw an Amish couple in their 50s or so lugging water bottles from a CVS store. I used to live in Arthur, Illinois so I know what Amish look like. This was the first time I’d seen Amish anywhere in Texas. I wonder if they were visiting a sick friend or relative in the medical center there. Thanks for sharing Lelan. This could very well be the case. A friend of mine who traveled to Mexico for his brother’s treatment spent a day touring San Diego while on the trip. He loved it but I’m sure he got attention. I’ve wondered what that might feel like as an Amish or other Plain person that stands out by appearance, with people constantly giving you second glances, especially when you travel to a non-Amish area. Maybe a little like being famous and getting paparazzi looks. One possible downside of traveling beyond traditional Amish stomping grounds. How do Amish travel in a horse and buggy on the Interstate? Wouldnt it back up traffic or cause a wreck especially during rush hour on a main freeway in a big city. Amish people do not travel in buggies on the interstate. First, most highways don’t allow non-motor vehicles like buggies, horses, bicycles, etc. because it’s not safe. Second, a horse cannot travel more than a few miles at a time anyway. For example, my friend’s husband worked eight miles from their home, and she said that was about the maximum they would do with a horse and buggy. That’s considered a long commute for them. So for long distances, Amish people will hire an “English” (non-Amish) driver or take a bus or train (they don’t usually fly in planes). I am taking a writing course online and I would like to do some research on the Amish community near Beeville. I would be interested in meeting with a member of this community to gather some information. Besides the crowded issue from where they came, he also said the humidity was lower in Beeville area (someone else had mentioned this), but I looked this up and in general the humidity in Beeville was not much different then that in the Tennessee’s area where they came from. They moved from Tennessee 14 years ago, and there are a total of 9 families. They don’t have the large families as is more typical in farmland communities. They do grow crops and he sells local produce in his store. He said he also sells to HEB, a large grocery store chain in Texas. He also builds horse drawn vehicles including buggies made to order. With only 9 families, the buggy side of the business is probably minimal. The upkeep of the farms was certainly lacking and nothing like the beautiful clean farms of Lancaster County, PA. I also wondered why in 14 years they didn’t plant a few trees. I’ll ask that next time. Being such a small community, I hinted around about the problem that must exist when boys and girls reach the marrying age. I saw two non-bearded boys at about the right age. I didn’t get an answer to this or to how many children there were in the settlement. I thought I might be over-stepping my bounds and decided to back off the subject quickly. I asked if they home schooled, and he said no, they have their own colloquial Amish school and a schoolhouse. I would like to know where and when the November auction will be. Can you post that information? They are Old Oder Amish, adherence to their beliefs are paramount to tidy properties and believe it vain to adorn self and property. What is necessary is what it important. Come on down to the sale, meet and see the best kept secret in Bee County. There is not another sale like this in the entire state. We have already posted pics of a large load of antique furnishings from the East Coast. I am “english”, have known them since 2005 and have been assisting with the auction for the past 8 years. My wife recalls that the Bishop in Beeville said the produce they sell to the HEB grocery chain goes to the HEB Marketplace which is located at 5601 Bandera Road in San Antonio. This makes sense. Of all the HEB stores in the area, this one location is unique and the only HEB that carries a wide variety of locally grown fresh produce. I’ve wanted to go to their auction for several years now. Unfortunately, that is always a busy time in my industry and it never works out that I can be there; as will be the case this year. I already have something scheduled for that week. Bob, I’ve seen you mention HEB in several of your posts. Are you living in Texas? You mentioned an HEB on Bandera Road in San Antonio; I’ve shopped in that store before while visiting family. Both of my parents were from small towns near SA & the vast majority of my relatives still live there. We get over there quite frequently as it is only a two hour drive from our driveway to I-10 and Loop 410. What would you say about getting together for lunch sometime? Forgive me if I’m intruding. I stumbled upon this page while looking for more Farmer’s markets in my area and found this. I’ve lived in Corpus Christi 15 or 16 years now (well, one of those years was in Sandia, just outside Mathis, but close enough to be considered Corpus, I think.) and I had no earthly idea this community existed. When my husband and I went out east for a vacation a few years ago I was disappointed when we didn’t have time to visit an Amish store or town. I’ve always had a curiosity about it. And as an artist myself, I’d always much rather buy something that is handcrafted than something mass produced if I can. I need to try to get up to Beeville to see this shop. Even if it’s not like the ones back east or in the mid-west. Texas does everything with its own style and flair and I think we tend to attract people that want to live life on their terms in some way or another, so it makes sense that would apply to an Amish group moving down here. About the humidity, it is very humid in Corpus. Much more humid than any part of Tennessee I’ve ever been to. When the humidity drops below about 55% for a few days the tv meteorologist start talking about how dry it is and remind people that they may need lotion or Chapstick today. It’s kind of amusing. Anyway, the humidity in Beeville can be a lot less than in other places. The general rule is when you’re close to the water, like much of Corpus Christi is, the temps in the summer are a bit cooler, the winters a bit warmer, and the daytime highs and night time lows don’t vary much. Likewise the humidity is fairly constant. Very little change from one day to the next and within a day. As you get farther inland, even just a few miles, that changes. It’s hotter in the summer and colder in the winter and you can get some of the same insane high humidity like we get in Corpus, but Beeville sees more change. There’s usually a bigger difference between the day’s highs and lows, and the humidity can change pretty drastically throughout a day and from day to day. All of that was to say that I can see why he’d genuinely think Beeville was a better option climate wise if they’re used to an area with a near constant level of high humidity. Really, once you grit your teeth and suffer through July, August and sometimes September, it’s not so bad. It’s rather desolate and barren, butit soundalike that’s exactly what he was looking for. Okay, I rambled on too long. I’m still in shock that this community was in my backyard so to speak and I never knew it. I’m eager to go check out the shop. Does anyone know when they’re open or what the best times to go there are? I’d hate to drive all the way out there just to find them closed or find the shop pretty much cleaned out of everything. my elderly mom with cancer, stage 4, living in dallas, tx area. What an excellent report on that settlement! I thought it was interesting to hear about your discussion with the Bishop. Thanks S-H-O-M. I’m glad it was of interest to you. With all the many things you have contributed, glad to pay back a little. And Linda, I will post the exact date, time, etc. of the auction when I get the notice. I suspect every Amish in the area will be there. The first Wed. in November (which is Nov. 6th) is all he said. I have his phone number, so if I don’t get a flyer by November 1, I’ll phone and find out for sure and post it here. I stumbled across this site after Googling “amish settlements in texas”. Thanks for the scoop on the settlement in Beeville. Especially check out the “Special Events” tab for details on the Labor Day and Thanksgiving Day fairs. Also, under the “Videos” tab, the last video detailing that children’s craft fair will give you a pretty good idea of why you might like to visit. They have 18,000 people come to visit over Thanksgiving weekend. They are annabaptist, but I visited the fairs for years on Labor Days and Thanksgivings before finding that out. (They aren’t pushy.) I have no association with them and live 150 miles away. But I enjoy visiting…picking up the “intentional community” vibes. They definitely have something working for them. The community north of Waco is not Anabaptist. They are Oneness Pentecostal. The man who founded it was a UPC minister before the church broke ties with the UPC. They have adopted some beliefs over the past 40 years similar to the Anabaptists. However, if you were invited to attend a Sunday service, you’d find typical Pentecostal worship. Would like to know what size is the group in Bee County. I will be moving in a town called Skidmore which is in Bee county. I enjoy the products of the Amish. Thank you for your time and trouble. There are 9 families, so I would guess about 50 total. It appears that the families are smaller in size as compared to other communities. The Auction/Sale date is set for November 6th, so that would be a good day to visit if you want to see most (if not all) of the Community. Bob thank you for the info. I live in Biloxi, Ms. When kitrana hit we lost everything here. We had a group that was from the north that we’re something like the amish but they beleave in elec but no phones are tv’s. My home here is awesome. I love the work they do and I was told that the Amish work was just as good are better. I know that they know alot about canning, making jellies, and pickling. So moving to Bee county and near a Amish community will be great. Thanks again. God bless you and yours. Outside of Waco, TX is a community that also lives similar to the Amish. They have some shops with regular business hours and their yearly festival is refreshing to visit. I am not affiliated but I lived in Europe for about 7 years and I can appreciate the lifestyle that they maintain. What is their lifestyle?? I would love to learn a different way to hold my own and not looking back. I have visited the Beeville communitie several times and foundMr.Borntrager to be stsnd offish but yet friendly once you get him to talk.We try to go on friday to buy their baked goods which are delicious.They sell cinnamon rolls pies jerky breads honey etc. I love to buy my spices there as they are reasonable.It definitely isnt Lancaster but it is still interesting.Once when we went all the men were working on a barn structure. It was like inhe books. We sell sand art snd the Borntragers hsve been kind enough to order little bears they use for their honey.The women eorking I n the fiekdd barefoot always take time to wave and the mrn driving theif buggys do the same. Sorry for the mis-spelled words. Didnt I have my glasses on. Erik Wesner if you mean the article on this page. I am wondering what your email address is because I am working on a school project and i have a couple of questions and it would be easier if i could email you rather than comment on your website. Would like to live a simpler life away from TV shows and what this society deems important. straight forward kind of relationships that make you pure at heart is what I would like to experience. knowledge of the Amish way of life. Work and family are what would prevent me from traveling now, but I’m not married and have no kids so I think it wouldn’t be much of a obstacle. I am a very honest, hard working, caring angel of a soul that wishes there was some other way to live in harmony with Mother Nature and all God’s creatures. Keep the Amish way alive. Lonestarstructures dot com. They would know. Lott is SE of Waco and NE of Temple in the ideal location to cover the entire state. This is probably a long shot, but is anyone familiar with an Old Order Amish community that existed in northeast Texas (DeKalb area) in the 1980s? The settlement didn’t work out, so they ended up moving back to Indiana, where they were originally from, toward the end of the 80s, from what I can tell. Any information would be greatly appreciated. Back in the 70’s and 80’s there were Amish living and working in dairies around Sulphur Springs and the surrounding areas. My sister and her husband were living on a dairy and her husband was working there just outside of Sulphur Springs, there were Amish working and living there, too! The store is open 8-5, they close for lunch, except on Friday. Friday is baked goods day. Eggs, honey, teas, essential oils, “Real Salt”, in season veggies and crafts are available during the week. They build horse drawn vehicles and make repairs. Shoe animals. Have a large herbal business, make crafts of woven baskets, alpaca wool blankets & rag rugs, and grow vegetables that are sold at the Combination shop and to the local HEB market. Produce in the store will have a small round sticker with an Amish buggy on it and say “locally grown Bee County”. The hitching posts were built by local Boy Scouts as part of their Eagle Badge project. It is hot and humid in Bee Co. but we usually have a breeze. Mr. T. Borntrager does indeed have a wry sense of humor. I am “english” and maintain the website and help with the auction. Hope to see you there. There is NOTHING like it in the state of Texas! There is one Amish family in the tiny Grimes County Community of Courtney. The leader of the Community there is Daniel Borntrager, he is the brother of the Amish Gentleman who runs the Amish store in Beeville, Texas. Daniel’s wife’s name is Ruth. They are building an Amish school out there off of FM 2 near the Luther Prison Unit.